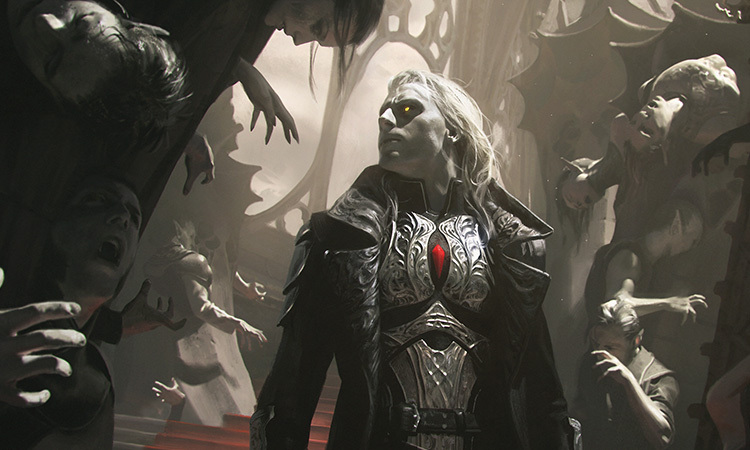 When Jace went to Markov Manor, he was hoping to find the vampire Planeswalker Sorin. What he found, however, was a manor in ruins, twisted into impossible shapes, its inhabitants embedded in the masonry. For Jace, it meant the start of a new mystery. But what he didn't know was that he had just missed Sorin, and that this declaration in stone was meant for the ancient vampire. Sorin's past has come back to haunt him. Though shunned by his own kind, he hopes to gather the aid of the vampires to confront the threat that has come to Innistrad. His search has brought him to the remote estate of the powerful Olivia Voldaren. A hundred or more pairs of eyes watched him from behind elegant masks as he made his way across the ballroom. Another person might have felt like a mouse among a host of owls in such company, but not him. He strode beneath the vaulted ceiling, his footfalls echoing so that they broke through the hiss of whispers that all spoke the same name. "Sorin Markov," came a musical voice above the whispers, a voice both feminine and sarcastic, a voice that formed the syllables of his name in such a way that it gave Sorin the impression it was the punchline of a joke long in the telling. But that didn't matter. What did matter was that it was a familiar voice, and that it belonged to the person he had come here to see. "It seems I have interrupted quite a party," Sorin said, sweeping a hand in a wide arc before bringing it to rest on his chest in a theatrical play at humility. "For that, I'm sorry. But please, Olivia, reveal yourself. We must talk." He scanned the room where so many vampires had gathered to partake in the lavish festivities prepared by their host. Sorin had attended dozens, if not hundreds of such events, but not for over a thousand years. At last, one of the vampires lowered her mask, a porcelain thing built in mockery of Avacyn's heron. She tossed it aside, and with as much effort as it took to blink, she rose into the air, a demonstration of the power that flowed in her ancient blood. 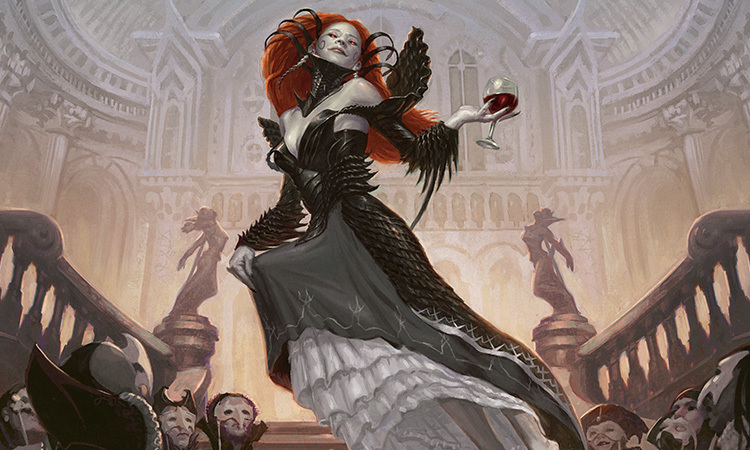 "I fail to imagine what it is we have to have to discuss, lord of Innistrad," Olivia said, bowing at the waist. It was her turn to wield theatrics in mock respect, and around the ballroom, laughter broke out. Sorin ignored the jape. This was her house, after all, and she could have her fun. He simply returned her gaze, looking up at her pale face, which was framed by thick red curls. He knew this game. She would appear as his superior. It was a performance she had practiced many times, but he was not one of these neonates who fell over themselves to garner her favor, and he would tolerate it only for as long as he could. "The scion of Edgar Markov is not welcome here," she continued. Then she gestured toward no one in particular. "Show him out." Without hesitation, half a dozen vampires emerged from the gathered celebrants. One of them drew a thin duelist's blade from its scabbard. "Lady Voldaren asked you to leave," he said. "You don't belong here." That was all he would tolerate. Sorin's own sword flicked out in a succession of flashes that left five of his escorts writhing on the ground, curls of black vapor billowing from deep wounds. Only one remained—the duelist—but Sorin looked past him to Olivia to make sure she was taking this in. She was. Then he raised his hand, and as the duelist lunged for him, Sorin curled his fingers into a fist, and suddenly, his assailant's body burst apart in a scattering of ashes. The room fell silent. He had their attention. More importantly, he had hers. Sheathing his sword, he stepped forward. There was a reason for his visit, and however rotten it tasted to Sorin, he said, "I have come for your help." Olivia's mouth widened into a smile until her lips parted to reveal teeth that had meant the end of countless human lives across the centuries. She floated down to him, her movements so smooth that the red liquid in her glass barely rippled. Despite the elegance of her gown, she was barefoot, just as she had been in Sorin's memory—ever the indulgent recluse. And now, as she drew close, her toes glided inches above the polished stone floor. Olivia looked Sorin over, tilting her head to one side then the other, as though trying to discern Sorin's meaning on her own. "My help? And here I was convinced that this would be an unpleasant visit." Sorin knew she would relish this, but he was growing impatient. "Well, at least this will be a memorable party," she said, punctuating her remark by raising her glass and tipping its contents into her mouth. Then Sorin was forced to sidestep as Oliva moved past him. The crowd of masked revelers parted before the Voldaren progenitor, who nonchalantly waved a hand, an invitation for Sorin to follow. The pair of ancient vampires made their way through a succession of rooms that were each filled with party guests. 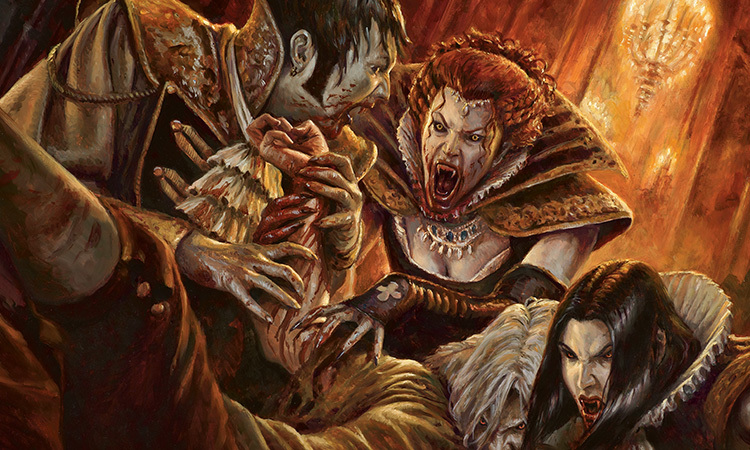 In a dim study, Sorin observed a handful of vampires huddled at one end of the chamber where a weak whimper, barely strong enough to garner attention, rose from their center. One of the vampires faced Sorin and, blood running down his chin, hissed his irritation at the intrusion. Beyond him, Sorin glimpsed an outstretched arm with ribbons of red running down its length. Beyond the study, Olivia led Sorin into an enormous dining room—a long, cavernous hall with a dozen chandeliers spaced out over the expanse of an elegant table hewn of black wood. Around it, even more of Olivia's guests were gathered, feasting on the decadent foods and drinking their fill. It was a room Sorin remembered well from his visits here, and he knew that Olivia had taken him the long way here. She'd wanted him to see the feeding, wanted to flaunt it. She must have thought it would get under his skin. How little she understood. "Out," Olivia said. Though it came off less a command and more as a playful suggestion, the feasters obeyed all the same. With their departure went the sounds of celebration. By the time Olivia and Sorin took their seats at the end of the table, the room was quiet. "Why here, Sorin Markov?" Olivia asked. "Why not go beg on your own doorstep?" "I take it you haven't heard." At this, Olivia raised an eyebrow. "My grandfather's manor is no more." Olivia laughed, and it was less melodic than Sorin had expected. "You find this news amusing?" he said. "The news isn't amusing," Olivia said. "The messenger, however..." With an easy grace, she collapsed into the cushioned back of her chair. "If Markov Manor is in ruins, then look to Avacyn, your own creation. She's already destroyed Castle Falkenrath and scattered that bloodline. Your creature is on a rampage. Frankly, the fact that I didn't tear you to pieces myself when you sullied my house is a mark of my generosity." "I'm going to let that go, Olivia, because I need you to listen carefully to what I'm going to say." He rose from his seat and leaned on his knuckles. "I have just come from Markov Manor. Know this—it did not meet the same end as Castle Falkenrath. I came to you because the ruin of Markov Manor marks the beginning of something terrible for this world." "Something terrible for you, you mean." Why not both? It was indeed terrible for him. But that didn't preclude danger to all of Innistrad. He never intended for it to come to this, and his thoughts drifted back to another age. Sorin's consciousness had been spread out across the weeks he'd been down here. Or was it months? Years? He couldn't be certain, but in the midst of his trance, a spot of white found him. It cut through all the layers of his awareness, growing closer with each moment, until finally, it touched him. And then, in the span of a heartbeat, the wayward parts of his mind scrambled over each other to find their correct places in his being. The rush was almost too great for him bear. Something had gone wrong. Something had pulled him prematurely from his restoration. When his eyes fluttered open, Sorin found himself sitting on the stone floor of a modest sanctuary. Slowly, he rose to his feet, a task that took more effort than it should have. He was still weakened and depleted, and as he gathered himself on unsteady legs, he noticed a dark stain that stretched out across the sanctuary floor—a permanent black shadow in the shape of an angel, a testament to the magnitude of his recent exertion, his creation. Then the white light once again strobed in Sorin's head, and with the fog of the trance lifted, Sorin recognized it for what it was—the signature of another Planeswalker arriving on Innistrad, drawn to his Helvault. Recovery would have to wait. Innistrad was his, and visitors could remain only at his pleasure. He must discover their intent. If it came to it, fighting a duel in his current state would be far from ideal, but a threat to his plane was unacceptable. Even diminished as he was, he was still more formidable than most, and besides, this time he would have help. In a burst of inky black smoke, Sorin Markov set off to discover who would dare intrude on his plane. Another burst of smoke, and Sorin materialized in the shade of a gnarled tree whose twisting branches ended in clusters of red leaves. From his vantage, the curtain of gray clouds served as a backdrop against which a rough, angular, monolithic chunk of silver rested upon a promontory at the edge of a sheer cliff. In the dim light, the silver mass appeared almost black. 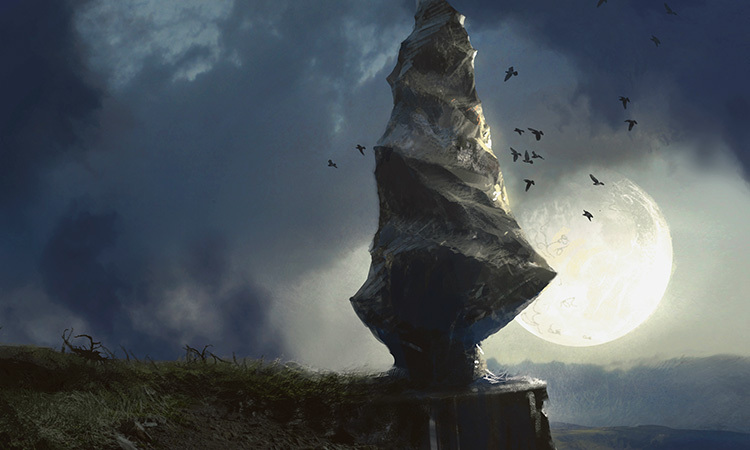 The Helvault—it had come from the plane's silver moon, and it had taken great effort for Sorin to bring it here. As he watched, a figure emerged from behind it. A woman, pale, with white hair that fell around her face in a messy array. As she came around, her fingertips brushed the Helvault's rough surface. She wore simple, drab garb, with a length of red cloth wound around a forearm serving as her only accent. She was a kor from Zendikar whom he'd known millennia ago. 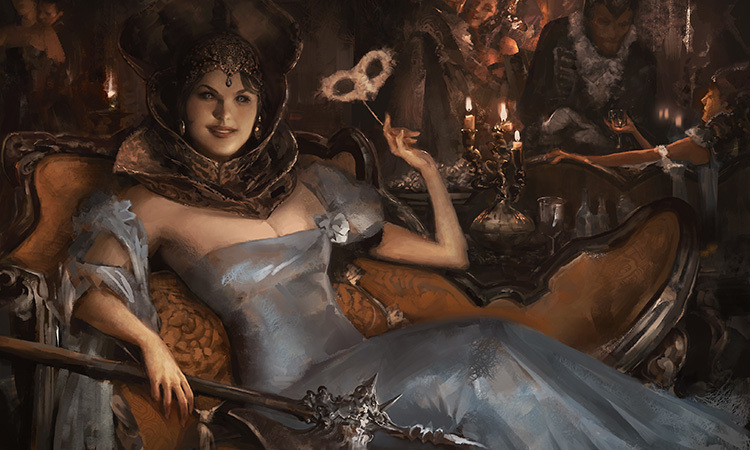 They had traveled together for a time, but not for many years, and the sight of her here on Innistrad struck Sorin as an oddity. In all their travels, he'd never brought her here. Their last encounter had been on her home plane, and because of the nature of their parting, he never thought he'd see her again. And yet, here she was. At the moment, Nahiri seemed captivated by the Helvault, so Sorin approached in silence. If anyone would appreciate what he had accomplished, it would be her. "You'll have to forgive my rudimentary attempt at shaping stone, young one," he said, standing behind her. At his words, Nahiri spun around. Her face broke into a wide smile as she stumbled over her first few attempts at a response until at last, the words burst from her lips. "And why would I be otherwise?" He manipulated the muscles of his face to form a smile, and reached out to place a hand on her shoulder. "You never came." She covered his hand with one of her own. "On Zendikar, when I activated the signal from the Eye of Ugin, you never responded. I feared that—"
Sorin withdrew his hand. "The Eldrazi have broken free of their bonds?" A caustic bitterness rose in Sorin's throat. "Where is Ugin?" He asked. "He didn't come either," Nahiri said, looking up at Sorin. "But I handled it. On my own. With all the strength I could muster, I managed to reseal the titans' prison." She spoke with a confidence that Sorin didn't remember. There was power in her that hadn't been there when they had known each other thousands of years ago. And suddenly, standing there with Nahiri, Sorin became keenly aware of his own weakened state. "When the task was done, I came to find you," Nahiri continued, "I had to know if you still lived. And here you are." After a moment, Nahiri's smile slowly faded. "So where were you? Sorin, why didn't you respond to the signal?" "It never reached me," he said. "Hmm." Sorin extended his arm past Nahiri and pressed his hand against the surface of the Helvault. "You dedicated yourself to watch over the imprisoned Eldrazi, and it became clear to me that my plane was in dire need of its own protection, particularly in my absence. This Helvault is half of what I created to serve as such protection. It's not inconceivable that your signal from the Eye was unable to break through the magic that protects this plane." Nahiri shook her head. "Did you know at the time that that would happen?" "It did not occur to me," Sorin replied. It was true, but he sensed an accusatory tone in her question, and he found himself weighing his words. "Though I see now that it was a possibility." "A possibility? You risked my plane, and more." There was hurt in her voice. "You abandoned me." Sorin waved away the kor's concerns. "I was simply taking the appropriate precautions to protect my plane. I hardly think—"
"We had an agreement, you and I." Nahiri's voice had suddenly shifted. It was icy, devoid of any of the warmth from only a moment ago. A sharp hiss escaped between Sorin's teeth, and Nahiri stepped toward, only for him to turn his back to her. "Don't dismiss this," she said. "I was willing to jeopardize my home by luring the Eldrazi to it. I promised to chain myself to Zendikar to watch over them as their warden. I spent millennia with those monsters. Do you know what that's like?" As she spoke, the ground began to rumble. "All you had to do was come when I needed you." 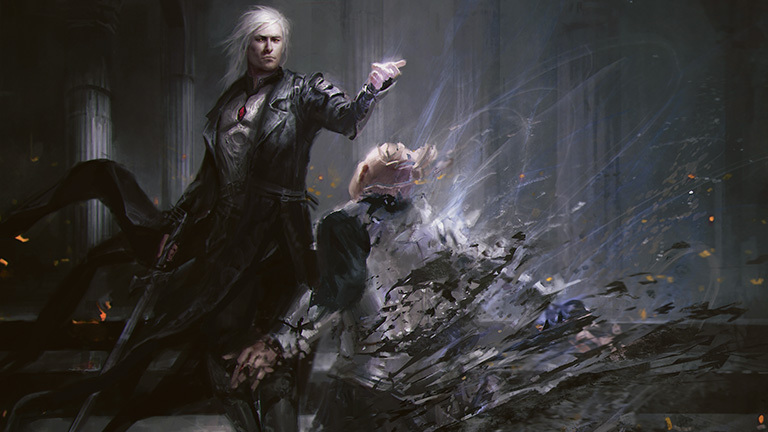 "Don't presume to own my actions, young one," Sorin replied, batting Nahiri's hand aside. "I am obligated to nothing. I owe you nothing! When your Planeswalker spark first ignited, it was I who discovered you. I could have ended you there, but I spared you." He rounded on her, and suddenly his face was only inches from hers. In a whisper, he continued, "I took you under my wing, and molded you into what you are. If you find it necessary to pester someone, go find Ugin. I have no patience for it." The earth lurched violently, and for an instant, Sorin had to fight to keep from stumbling. Beneath Nahiri's feet, a column of bedrock pushed through the soil to carry her into the air. "I'm not going anywhere." Sorin picked up a crystal glass to inspect the ruby contents within. A thin film had begun to form across its surface. Between two pale fingers, Sorin twisted the delicate stem of the glass so that the film gave way and the liquid sloshed freely. He raised the glass so that the light of the chandelier filtered through it, and he watched shapes of red light stretch out over the nearby place settings on the table. "Do you know why I created Avacyn, Olivia?" Sorin said at last. At the mention of that name, the smirk dissolved from Olivia's face, and Sorin took some amount of pleasure in that. "I created her to be this world's protector." Olivia clicked her tongue as Sorin sniffed at the blood in the glass before setting it back on the table. "A protector," she mocked. "You dare come to my house and disturb my guests with this absurdity?" It was her turn to rise from her chair. "We haven't spoken since your treachery—since you shamed your grandfather's noble name. The fact that you sit here across from me at my own table is a shame that I will have to bear. But if you think I will tolerate your attempt at playing hero—"
"Are you finished?" Sorin interrupted. He wasn't here to justify himself. Not to her. But he was here to explain some things. "It is indeed true that our gift of longevity is too often paired with shortsightedness, but there are people who are greater threats than our overzealous grazing." Olivia drained the remaining blood from her glass. "One of these people," Sorin continued, "has come here, and she threatens our entire world. I can't allow that." Sorin lifted his gaze to where Nahiri loomed over him from the height of her granite pillar. All around them and between them, a field of stones floated in the air, defying gravity in favor of a more powerful master. They were an obedient army waiting for her command. Even as the wind whipped through Sorin's hair and tugged at the leather of his long coat, the myriad stones hung motionless in the air, and it seemed to Sorin as though the entire plane was holding its breath. There was no doubting the power that Nahiri now wielded, the power that had matured with her. Stone did not simply obey her command. It was part of her, and through it, she could reach across all of Innistrad and leave his plane in ruins. The only stone that remained beyond Nahiri's influence seemed to be the Helvault, so Sorin had put his back to it to keep from being assailed from all sides. If he had been at full strength, he would have made short work of this whelp. But his energy was still spent, and as he leaned on his sword to keep from collapsing, he cursed himself. With a sound like snapping bones, Sorin watched as Nahiri's pillar rumbled into motion, carrying the lithomancer slowly toward him. The stones parted before her, and as she passed an elongated slab, she plunged her hand into it as easily as reaching into a pond. After a moment, the whole stone grew red, and then shattered into a million pieces until all that remained was a fully formed sword in Nahiri's grasp. The blade still glowed, fresh from its stone-forge, and Sorin found himself facing off against its white-hot point. "Sorin," Nahiri said in a voice that carried through all the stones so that it seemed to come from everywhere at once, "you will fulfill your promise. You will return with me to Zendikar. You will help me check our containment measures, and ensure that the Eldrazi are secure. Only then can you slink away." His eyes tracked up past Nahiri's sword and the end it promised, to the dark cloudscape that churned above them. He did feel it, and as he watched, a spear of light punched through the gray. The clouds retreated, and a silvery comet tore through the gap. 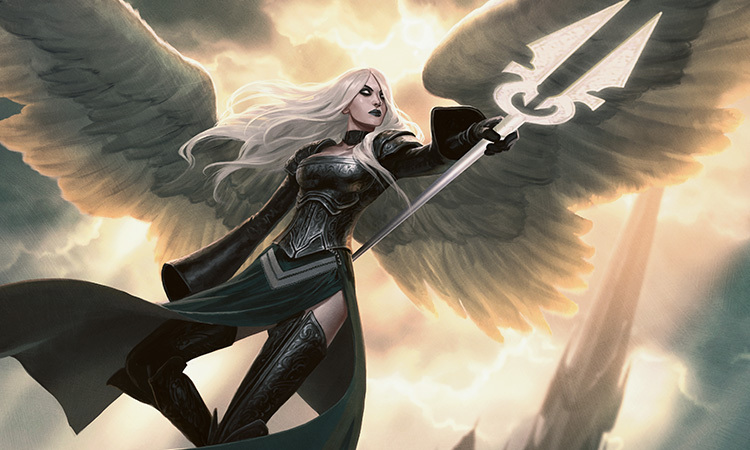 Avacyn. His Avacyn. She had come to protect Innistrad from a planar threat—just as he had made her to do. At first, Nahiri didn't seem to notice. And when she did, it was only with enough time to meet the archangel who came barreling into her with enough force to carry both figures off the stone column. Sorin watched as they tore a deep gouge in the earth where they fell. And with them, the countless suspended stones clattered back to the ground. When at last the two figures stopped tumbling, it was Avacyn who recovered first. She raised her spear, and light bloomed along its twin points, growing in intensity until it became almost too bright to behold. Sorin strained against the brilliance. He watched as Nahiri was swallowed up in the earth, just as the archangel drove her spear through empty space. As the points bit into the exposed bedrock, the surface burst in spray of broken stone and dust, and Avacyn was forced to protect her face with her arms. From where he stood, it took Sorin a moment to realize what was happening, but through the dust he saw Nahiri raining down blows with her still-glowing sword. The blade cut through the air, leaving trails of orange light as it went. Sparks leapt off of Avacyn's spear as she deflected the onslaught. But the blows were too many, and too fierce. Soon, Avacyn was in retreat. She tried to fly, but Nahiri rose up above her on another column of stone, forcing the archangel back to the ground with her unrelenting attack. Nahiri would destroy Avacyn. The thought welled in Sorin more like a glimpse of reality than one possibility among many. No! Creating Avacyn had taken too much out of Sorin to let Nahiri end her here. With what strength he could find, he threw himself forward. "Enough!" he rasped, and when Nahiri's sword arced down again, it clanged against Sorin's own weapon. "Enough," he said again. For a moment, the two Planeswalkers remained face to face, with blade pressing against blade. Sorin studied her. Her eyes were fixed on Avacyn, and in those eyes Sorin recognized confusion. "What is this, Sorin?" Nahiri said through clenched teeth. "How did you bring an angel under your thrall? Who is she? "The other half," Sorin replied. He lashed out with his off hand to grab Nahiri's sword. The hot blade hissed as his fingers closed around its sharpness, and as Nahiri struggled to free it, Sorin brought the point of his blade up to her throat. Streaks of sweat had cut through the mud that clung to her skin, and her features had taken on a severe quality. Or perhaps it was just defeat. 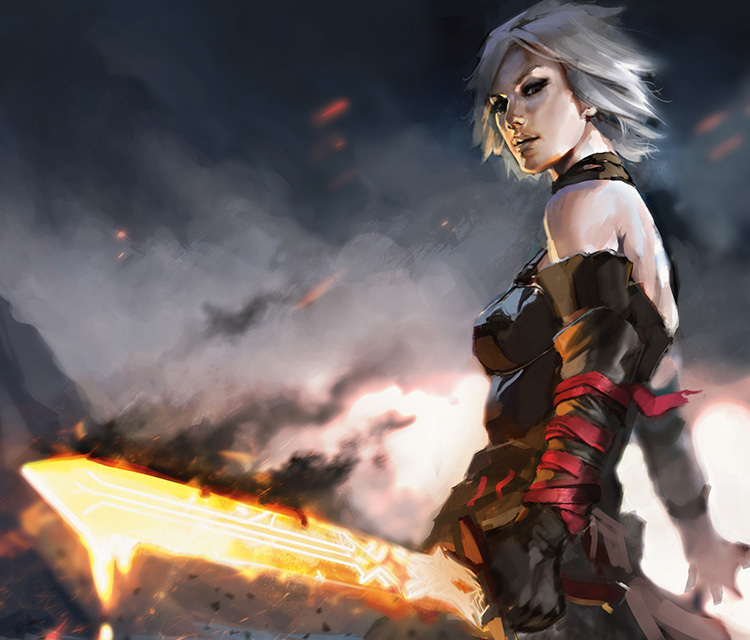 Nahiri released her grip on her hilt, and Sorin tossed the blade aside. Behind him, Sorin felt Avacyn approach, and he held up a hand to stay her spear. Then, to his former protégé, he said, "For what it's worth, I never wanted this, young one." "Sorin?" Olivia said. Hearing his name only made Sorin aware of the silence that had swelled to fill the room in the long moments since he had last spoken. "Sorin," Olivia said again. "Who is this threat? Or rather, what did you do?" "Too much. Not enough," he said, staring down the length of the black banquet table. His mind was still replaying the events that had played out centuries ago. "Come now, Sorin. You can't decide to become cryptic at the best part." Sorin turned to her, but said nothing, even as that smirk of hers found its way back onto her face. "I must admit that you have piqued my interest. Anything that can get under your skin is most captivating. But you came to me, Sorin. So tell me, what I can do for you?" In an instant, the fog of the past evaporated. "Summon the might of your bloodline, Olivia. The remnants of the Markovs are already mustering. Together, our combined host can confront this threat." "Why should I? Why I shouldn't I throw in with this...threat? Illuminate me, how do I benefit from—"
She stopped mid-sentence, and suddenly broke into a laugh that seemed at odds with her melodious voice. Her eyes flashed with a frenzied glee that Sorin recognized as a look meant for prey. "Oh, Sorin," she said as regained her composure. "I will help you. But first you will help me."